Sourav Ganguly laid to rest speculation over his form and fitness with a strokeful 117 on the second day of the Duleep Trophy cricket match between East Zone and North Zone here today. The Indian team may have some surprises up its sleeve for Sri Lanka in the coming one-day series, coach Greg Chappell indicated today. Abhiranjan Negi, eldest son of former Indian goalkeeper and coach, Mir Ranjan Nagi, died in a road accident in Mumbai today. He was 22. He was a student of hotel management. Abhiranjan, according to family sources, had come home for Divali holidays. four-year title drought when he annexed the Royal Challenge Samarvir Sahi Amateur title in a thrilling encounter at the Chandigarh Golf Club here today. 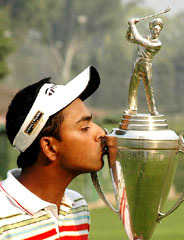 Anirban Lahiri kisses the Royal Challenge Samarvir Sahi trophy after emerging winner at the Chandigarh Golf Club on Friday. Team MRF's Arjun Balu and co-driver Kumar Ramaswamy finished first during the Super Special Stage of the HPCL Power M1 Challenge, clocking 2.20 minutes, in the fourth round of the MAI's Indian National Rally Championship. Naren Kumar finished second. Following Naren were Karandeep Singh and Arjun Rao Aroor both clocking 2.22 minutes, while Sandeep Sharma was the fifth fastest (2.23). fifth-seeded Kamala Kannan 6-0, 6-2 and storm into the men’s singles final of the DSCL Open National Tennis Championship at the Delhi Lawn Tennis Association deco turf court here today. Edeh Chiddi's first half brace helped Sporting Clube De Goa edge past State Bank of Tranvancore 2-1 and enter the quarterfinals of the 27th Federation Cup here today. BSF and CRPF entered the semifinals of the 30th All-India Gurdarshan memorial football tournament at the Ripudaman College grounds here today. In tomorrow’s semifinals, JCT Academy meet PSEB while BSF square off with CRPF for a place in the final slated to be played on October 23. Black Elephant CC, Patiala (U-14), defeated LNIPE, Gwalior, 2-1 in a three-match series played in Gwalior on the invitation of the Laxmi Bai National Institute of Physical Education, Gwalior, recently. Bimal Mahato gets direct entry for New York marathon. The 142-ball effort, studded with 18 fours and six, by the East Zone skipper helped his side take a 113-run first innings lead over North, who were 106 for three in their second innings at stumps. East had the edge due to Ganguly, who had taken three crucial wickets in North’s first innings, restricting them to 178. The all-round effort of the Bengal batsman, especially his fluent strokemaking, laid to rest the doubts over the past few days about his form and fitness, the two factors which saw him losing his place and captaincy of the Indian team. Ganguly came in when his side was in real trouble at 54 for three but showed good temperament in steadying the innings with a mix of aggression and patience. Resuming this morning at 77 for four, Ganguly stitched two useful partnerships with his Bengal team-mates Laxmi Ratan Shukla (31) and Deep Dasgupta (57). He added 125 runs with Shukla for the fifth wicket before putting on 72 runs for the sixth with Dasgupta who slammed 11 fours. Ganguly, who was batting on 19 overnight, reached his hundred before lunch as East Zone scored 158 runs in the morning session in just 30 overs. However, Ganguly was dismissed just after lunch off leg spinner Amit Mishra, the thick outside edge being taken by Pankaj Dharmani. In a strong fightback, North openers Shikhar Dhawan and Ravneet Ricky put up a 105-run partnership before it was broken by SS Paul. After the departure of both openers, nightwatchman Gagandeep Singh was dismissed without scoring as North Zone were 106 for three in the second innings at draw of stumps. Vadodara: West Zone staged a great recovery with Wasim Jaffer cracking a superb 133 off 197 balls to propel the side to a commanding 314 for eight in their first innings on the second day of the four-day Duleep Trophy match at the Motibaug Palace ground here on Friday. Replying to South Zone’s 219, West, which resumed at the overnight score of four for two wickets, were in dire straits when Laxmipathy Balaji sent opener Dheeraj Jadhav (1) in the second over of the day to make it five for three in 6.1 overs. Balaji’s figure then read 3.1-0-3-3. However, Jaffer, who came at number four, played stubbornly against South’s pace and spin attack with verve. After half the side returned back to the pavilion shortly after lunch with only 79 runs on the board, Jaffer got a good partner in wicketkeeper Parthiv Patel (56) as the duo surpassed the South total of 219, producing a record 145-run partnership for the sixth wicket off 166 deliveries in 122 minutes. After toiling hard for two long hours, South skipper VVS Laxman finally got the much-needed breakthrough when left-arm spinner Sridharan Sriram trapped Parthiv leg before 30 minutes after tea at the total of 224. Their 145-runs stand for the sixth wicket bettered West Zone’s previous highest of 127 recorded in 1983-84 by Ravi Shastri and Ramesh Borde. Talking about the three-day camp that concluded today, Chappell said: “The objective was really to try a few things we are planning to use against Sri Lanka. We looked at a few different tactics and a few different bowling combinations”. During the camp ahead of the series in which India play seven one-dayers against Marvan Atapattu’s side, the players did a closed-door video analysis of the Sri Lankan team. Chappell said Kerala speedster Sreesanth, the lone new face in the 15-member squad named for the first two games against the islanders beginning at Nagpur on Tuesday, would be given the new ball. “More than likely that Sreesanth would open the attack in the games that he plays. But we are likely to try different combinations at different times. But at this stage, we would be using him as an opening bowler, yes”, he said. On the morale of the Indian squad, the coach said: “We are in pretty good shape, mentally and physically. The group is looking pretty good. We will only find out when we get there. But from the point of view of preparation, everyone is quite happy”. Chappell said the camp went off very well from his point of view and from that of the players. “We got quite a bit out of it”. He said Yuvraj Singh and Murali Kartik were unwell with fever in the last two days. “All in all, I am very happy with the three days”, he said. The only “downside” he saw was the absence of Rahul Dravid and Virender Sehwag from the camp. But Chappell said since the two are joining the squad assembling at Nagpur two days before the first one-dayer, they would be brought together nicely. According to him, Anil Kumble, Ashish Nehra and Mohammed Kaif, who are under rehabilitation, are a few weeks away from playing competitive cricket. Chappell said Sachin Tendulkar is on the path to finding his form again in the coming series against Sri Lanka and South Africa. "Looking back at Mohali through the first two days, training here and his batting today, I think he is well and truly on track to be back in good form both mentally and physically," he told reporters. Greg Chappell today sought to steer clear of any potential controversy by declining comments on the time span for the return of Sourav Ganguly, who was replaced as captain by Rahul Dravid. Asked if there was a possibility of Ganguly returning to the side in the wake of his return to form with a century for East Zone in the Duleep Trophy tie against North Zone today, Chappell said: “Not for the first two games against Sri Lanka. On the possibility of Ganguly returning to the side after the two games, Chappell said: “You have to ask the BCCI and the selectors; that’s not something I can answer”. “I am not going to comment on selection issues”, he said. Abhiranjan Negi, eldest son of former Indian goalkeeper and coach, Mir Ranjan Nagi, died in a road accident in Mumbai today. He was 22. He was a student of hotel management. Abhiranjan, according to family sources, had come home for Divali holidays. The bike he was riding hit a road divider and he died of head injuries, said Anand Phillar, a senior hockey journalist, and a close friend of Mir Ranjan Negi. 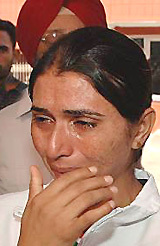 Anand also expressed his shock at the death of Abhiranjan. International hockey players, including several Olympians, rushed to Negi’s house. Among those who condoled Abhiranjan’s death were Dhanraj Pillay, Clarence Lobo, Iqbaljit Singh, Joaquim Carvalho, MM Gomes, Merwyn Fernandes, Edgar Mascarenhas and several others. Rajinder Singh Sr, Surinder Singh Sodhi, Gurmail Singh, Jagdeep Singh Gill and Charanjit Kumar, all members of the 1982 Asian Games squad, have expressed their sympathies with Mir Ranjan Negi and his family. Sukhvir Singh Grewal, Hardeep Singh Grewal, Ramandeep Singh Grewal, Gurdishpal Singh and Pargat Singh also condoled the death of Abhiranjan. The cremation will take place tomorrow. Anirban Lahiri ended a four-year title drought when he annexed the Royal Challenge Samarvir Sahi Amateur title in a thrilling encounter at the Chandigarh Golf Club here today. The 18-year-old clinched the issue by a solitary stroke over a fighting Gaganjeet Bhullar and finished with a four-day tally of level par 288. Bhullar had to settle for the second spot while Gagan Verma struck form a bit late in the tournament to finish third with a total of 290. Manav Jaini was fourth at 291, while Jaskeerat was fifth at 293. Himmat Singh Rai was tied for the sixth position with three others —Shaurya Singh, Jasjeet Singh and Rahul Bakshi. Simarjeet Singh finished 10th at 297. Anirban Lahiri, who began with a single-stroke lead, consolidated it to two strokes at the end of the front nine, courtesy birdies on both the par-5s — the second and the seventh. With a blemishless forward journey, the Bangalore lad was set for an easy victory. However, there was a twist in the story as he made a bogey on the 12th which was nullified by a birdie on the very next hole. He suffered another bogey on the 15th. Meanwhile, Gaganjeet had begun with a bogey but had recovered with two birdies on the second and ninth to stay in contention. A bad drive on the 16th saw Lahiri go out of bounds and the best he could do was to lose two strokes. Gaganjeet was sitting for a four-feet birdie putt. The Kapurthala lad missed a golden opportunity to go into the lead as he missed a sitter and ended up with a par. With scores tied coming on to the 17th, Gaganjeet bogeyed while Lahiri parred to give the Bangalore boy a single-shot lead with one hole to go. Both of them had solid drives on the finishing hole and Gaganjeet hit his second shot to about six feet and looked an easy putt for birdie. Lahiri’s hit it to about 12 feet and had to birdie to avoid the play-off. Taking things calmly as he could, Lahiri drained the putt for his maiden title on the Royal Challenge Indian Golf Tour. Gaganjeet also made the birdie putt, but was a bit too late in the match. “The victory has still not sunk in. Probably it will take a day or two,” said a smiling Lahiri. “Actually the chip-in on the 11th in the third round changed the whole scene for me. And today when I double-bogeyed the 16th, I thought it was the end for me. Luckily for me, Gaganjeet missed the birdie putt,” he added. The Samarvir Sahi trophy was given away by Mr G.P.S. Sahi, father of Samarvir, in whose memory the tournament is held every year. Top scores (72 holes): 288 Anirban Lahiri (71, 74, 70, 73); 289 Gaganjeet S. Bhullar (74, 72, 70, 73); 290 Gagan Verma (71, 74, 74, 71); 291 Manav Jaini (71, 75, 71, 74); 293 Jaskeerat S. Dullet (73, 73, 72, 75); 296 Himmat Singh Rai (71, 75, 76), Shaurya Singh (75, 75, 70, 76), Jasjeet Singh (74, 73, 72, 77), Rahul Bakshi (71, 73, 74, 78); 297 Simarjeet Singh (73, 75, 77, 72); 299 Raj Randhawa (75, 75, 75, 74), Vikram Rana (76, 73, 72, 78); 300 Joseph Chakola (73, 77, 75, 75); 302 Amanjyot Singh (77, 75, 72, 78); 303 Balpreet Ghuman (74, 76, 75, 78). Following Naren were Karandeep Singh and Arjun Rao Aroor both clocking 2.22 minutes, while Sandeep Sharma was the fifth fastest (2.23). Five drivers were tied for the sixth spot, all coming home in 2.24, and besides Lohit Urs and Moosa Sherief of Team MRF, there was Vikram Mathais and Sujith Kumar of Team JK, 1400 cc driver Prithveen Rajan/P V S Moorthy, Ranjith Ballal/Ramesh Kumar (1600cc) and Sunny Sidhu/H S Bawa (Gypsy). 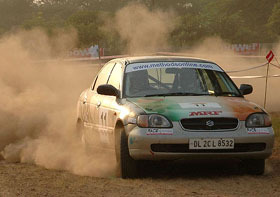 The fastest timing in the Rally Star Cup was 2.25 minutes, logged by Chetan Shivram and co-driver Rupesh Kholay. Results: Overall: Arjun Balu/Kumar Ramaswamy (Team MRF, Baleno) 2.20; Naren Kumar/Ram Kumar (Team JK, Baleno) 2.21; Karandeep Singh/Jaidas Menon (Team MRF, Baleno) 2.22; Arjun Rao Aroor/Chandramouli (Team MRF) 2.22; Sandeep Sharma/Kulbir Singh (Gypsy) 2.23; Lohit Urs/Moosa Sherief (Team MRF, Baleno) 2.24; Vikram Mathais/Sujith Kumar (Team JK, Baleno) 2.24; Prithvin Rajan/P V S Moorthy (Esteem) 2.24; Ranjith Ballal/Ramesh Kumar (Baleno) 2.24; Sunny Sidhu/H S Bawa (Gypsy) 2.24. 1400cc: Prithvin Rajan/PVS Moorthy 2.24; Sanjay Agarwal/Pradeep Kumar 2.25; Philipos Mathai/Ashwyn Naik 2.26. Rally Star Cup: Chetan Shivram/Rupesh Kholay 2.25; Amanpreet Ahluwalia/Manoj Shadija 2.27; Girishankar Joshy/Srikanth G M 2.28. Gypsy Cup: Sandeep Sharma/Kulbir Singh; Sunny Sidhu/H S Bawa; Suresh Rana/Jasdeep Sandhu 2.25. Southpaw Sunil Kumar Sipaeya lived up to his top billing to make short work of fifth-seeded Kamala Kannan 6-0, 6-2 and storm into the men’s singles final of the DSCL Open National Tennis Championship at the Delhi Lawn Tennis Association deco turf court here today. Sunil will meet Ashutosh Singh of Delhi, who upset second seeded Vijay Kannan 7-5, 6-4, in the title clash tomorrow. Top seed Isha Lakhani will clash with second seed Sonal Phadke in the women’s singles final. Isha, playing a crafty and power-packed game, raced past Shalini Sahoo of Delhi 6-1, 6-1 in just 55 minutes, while Sonal Phadke made mincemeat of Parul Goswami of Delhi 6-1, 6-2 in one hour and 25 minutes. The most-awaited clash was the one between former champion Sunil Kumar of Chandigarh and Kamala Kannan of Tamil Nadu, which, in the end, turned out to be a one-sided fight. Kannan, whose kit bag was stolen last evening, got it back before the semifinal after the police found it abandoned in the nearby Sarojini Nagar market. It had four tennis racquets but not his mobile and wallet. Kannan started off badly when he dropped his serve in the first game of the first set. This made him further dispirited as he failed to hold serve in the set, and Sunil cruised to victory. Sunil was cool and effective as he finished off points with quick court coverage, and through net volleys. Though Kannan possessed a powerful, double-handed return, he lacked direction and sprayed his returns long and wide, to make matters easy for Sunil, who won quite comfortably to set up his third title clash. Sunil, who had turned the corner in his tennis career after he won the DSCL Open title five years ago, made the final once more, but finished as the second best. For Kamala Kannan, it was his first entry into the last four the DSCL National Open Championship, and a good one at that. Chandigarh (OSR): Kinshuk Sharma, a Chandigarh Lawn Tennis Association (CLTA) trainee, has made it to the final of the DSCL Open National Tennis Championships being played in Delhi. Kinshuk, a student of DAV Senior Secondary School, Sector 8, defeated second seed Saket Sai Myneni of Andhra Pradesh 6-2, 3-6, 6-2 in the boys under-18 semifinals. In the quarterfinals, Kinshuk defeated Rohan Gide of Maharashtra 7-6(3), 6-4. Kinshuk will play the final tomorrow against Arnav Jain, who defeated top seed Sumit Prakash Gupta 6-4, 7-6(4). Appreciating the performance of Kinshuk and Sunil Kumar, also a CLTA trainee, Mr Rajan Kashyap, Chairman, CLTA, stated that these boys would be given cash rewards. Edeh Chiddi's first half brace helped Sporting Clube De Goa edge past State Bank of Tranvancore (SBT) 2-1 and enter the quarterfinals of the 27th Federation Cup football here today. Sporting, who held territorial advantage over their rivals, scored both the goals in the first half through Edeh Chiddi (29th, 45th). In the quarterfinals played today, a resilient BSF, winners of the Governor’s Cup played in Sikkim earlier this month, rallied to stifle a strong challenge posed by Khalsa College, Jalandhar, by posting a 2-1 win. Early in the first half, BSF were stunned by a brilliant effort of Khalsa College medio Gurpreet Kumar, who so swiftly scored his team’s first goal off a well-placed lob that the defenders and the goalkeeper barely got a chance to blink. A dazed BSF coach, Avtar Singh, effected a couple of substitutions which rejuvenated the Jalandhar security men who started attacking with vigour. Midway in the first half, defender Deepak Kumar picked up a loose ball and set up medio Saiful Nada, who made his way into the danger area virtually unchecked by the rival midfield. However, in an attempt to score of an acute angle, Saiful messed it up but fortunately for BSF the ball landed at striker Santosh Kujur’s feet. The smooth-flowing BSF striker’s feeble shot rolled into the goal through the legs of an astounded custodian Gurwinder Singh. Towards the fag end of the second half, BSF struck the winner through substitute Kamal Kishore. In the second match, the experienced CRPF downed Sultan Sports Club, Jodhpur, 1-0. The Jodhpur team, seeded directly into the quarterfinal stage, could not get going primarily because they played more as a bunch of 11 individuals rather than as a team. Black Elephant (MES) CC, Patiala (U-14), defeated LNIPE, Gwalior, 2-1 in a three-match series played in Gwalior on the invitation of the Laxmi Bai National Institute of Physical Education, Gwalior, recently. In the first match, BE (MES), Patiala, scored 199 for three in the allotted 50 overs. Opener Shivin Goyal struck 52, while Karan Kaila remained unbeaten on 54. LNIPE were bundled out for 99 runs in 32 overs. Ujjwal Sharma (5 for 17) and Sukhminder Singh (4 for 4) were the main wicket-takers. Kartik chipped in with one for 11. The Gwalior team came back strongly in the second match as Patiala boys lost by six wickets. Patiala boys scored 103 for five in the 35-over match. Skipper Ujjwal Sharma was the top scorer with 31 (n.o.). In the third match, BE (MES) defeated LNIPE by seven wickets. AMRITSAR: Nishan Singh of Amritsar, who won a gold medal at the World Police Games, won the 800 metres race on the first day of the three-day 11th Border Range Police Games and Athletics meet, being held at Guru Nanak Dev University on Friday. Local Harjit Singh and Sulakhan Singh of Batala Police were second and third, respectively in the event. In the 100 metres race, Satnam Singh, Dalbir Singh of Batala and Satnam Singh of Majitha were first, second and third, respectively.